Xi Hu is now a protected area. Only the leaves picked within the designated 168 sq km of Xi Hu area can be considered as Xi Hu Long Jing. To ensure its authenticity, we will provide a coded anti-fake label issued by Hang Zhou's Quality Control Department (for 100 grams and above only). 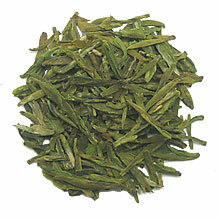 Exquisite flat and narrow emerald green tea leaves. 1 bud and 1 to 2 leaves. The tea leaves easily sink to the bottom of the cup during infusion.